The structure is a project and network based organisation model. Each state and territory will be represented by a nominated person who is either the state/territory portfolio executive or an appointed state/territory member. Councils Watch – managed by Joe Lenzo who will exercise on-going community oversee and variation reporting of councils’ governance performance and their on-going compliance to the Fair Go Rates policy and other reform initiatives implemented and in development. Strategic Pilots – program manager tba. This state function will involve liaising with the national Strategic Projects program, to organise and manage pilot deployments of strategic projects and partnerships and develop state/territory locations frameworks. 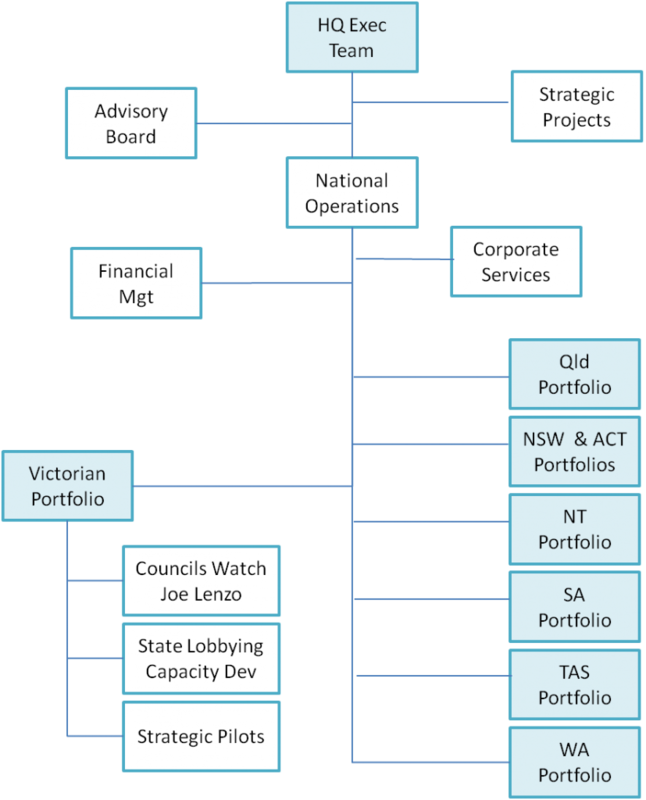 Other state/territory advocates will work with the national executive team to agree and plan their portfolio goals, strategies and deployment projects. Watch this space develops…..